Famous for its Sun Temple, Konark is a small town of the district of Puri of Indian state of Orissa. It is also known as Konaditya.The Sun temple of Konark is also called as Black Pogada and is built by Raja Narasinhgs Deva-l of Ganga Dynasty. The best time to visit konark is from October to march when temperature is lower than the temperature in summer which touches to 43c. 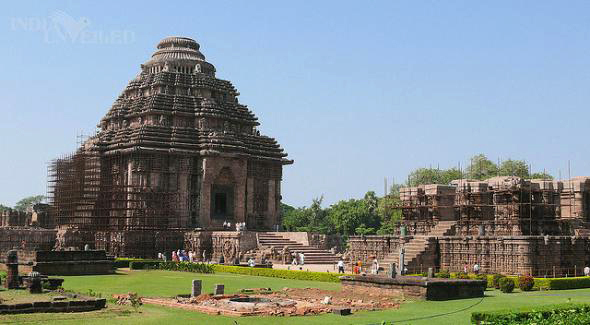 Konark is known for housing the world famous the Sun Temple, a UNESCO recognized World Heritage Site. It is the most important tourist attraction of Konark. The temple is dedicated to Lord Surya (the Sun). Architecture of this marvelous temples reach to its highest peak. Other than Sun temple Konark also offers other places of attraction. Chandrabhaga Sea Beach is one of them. It is about 3km away from the Sun Temple. The beach is beautiful place to spend time. Lighthouse near the beach add the splendor of the place. It also houses a natural deer park. Kuruma is popular Buddhist site. It is the monastery built in 9 and 10th century. It houses excavated statue of Buddha. Located on the bank of Pranchi, Katkapur is a small village just 30km away from Konark. The village houses a famous temple goddess Mangala. This Katakpur temle of goddess of Mangala is closely related with the famous temple of lord Jagannathe of puri. Road connects the village of Konark to other parts of the state and country. Many state run buses and other private vehicles like cars and luxury buses are available from other cities and towns of the state and country. Nearest railway station for Konark is Puri railway station which is just 31km away. The railway station is well linked by many trains to other cities and towns of the state and the country. Bhubaneswar is the closest airport to Konark. It is just about 64 km away from the Konark. The airport is well connected by many domestic flights to other major cities of the country.